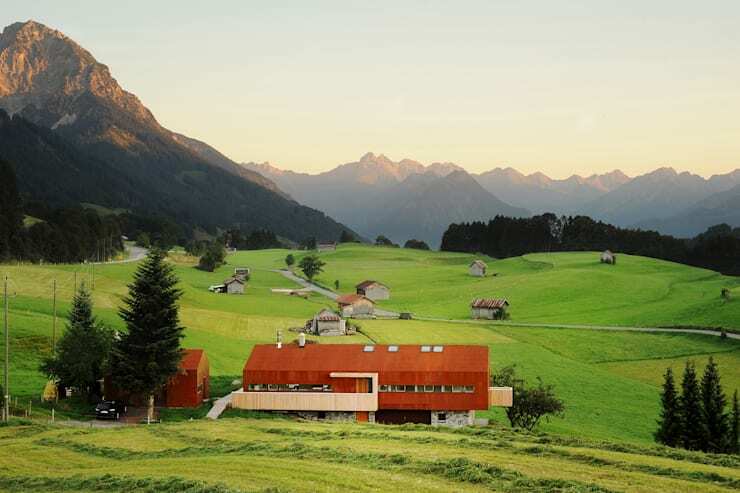 Take a piece of land in the mountains and about two years of planning and building – the end result is an absolutely stunning house with a floor space of 296 square metres. The newly built home showcased in this Ideabook is really a tour de force in architecture and design. And although it displays the typical mountain hut style, which is fairly common, perhaps because it fits so well with the rural surroundings. Today we begin our tour of this beautiful farm style villa with a look at the building during dusk. 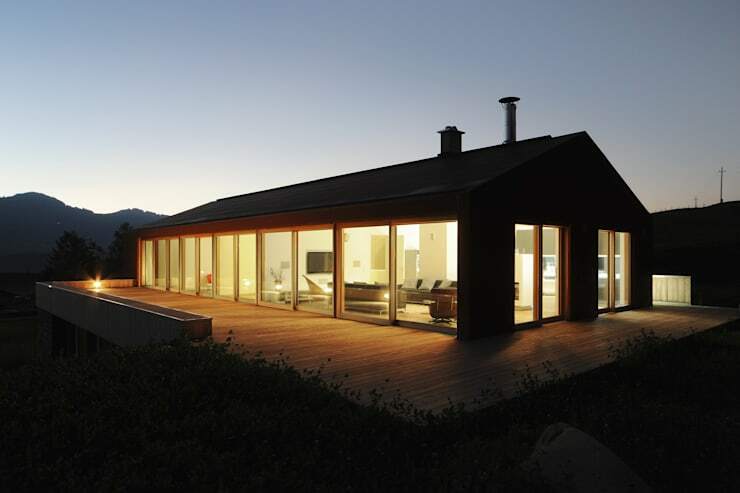 This means that the interior lights are giving and shows off the fantastic layout of this modern home in the hills by allowing the inside to shine. The brilliance of the home, its simple and minimal features as well as the taste and style of the furniture and fittings is what makes this house a true country gem. The location of this house is just breathtaking! Majestic mountains, lush meadows and sweet cottages surround the building creating a phenomenal backdrop. And where do you find this idyllic postcard landscape? 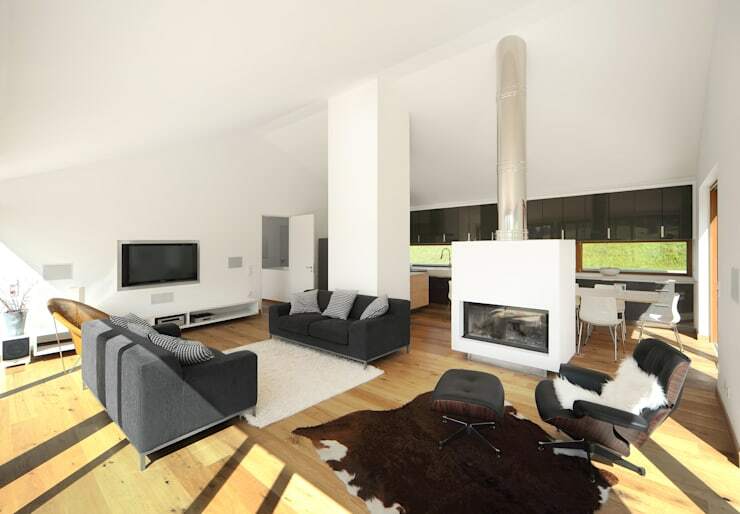 For this you have to head completely to the south of Germany, in the Upper Allgäu, it is situated in the southernmost district of the county town of Sonthofen, where architect Carlos Zwick has fused the contemporary property with stunning nature. A glance at the interior reveals that this is a completely thought-out concept of inside and outside. 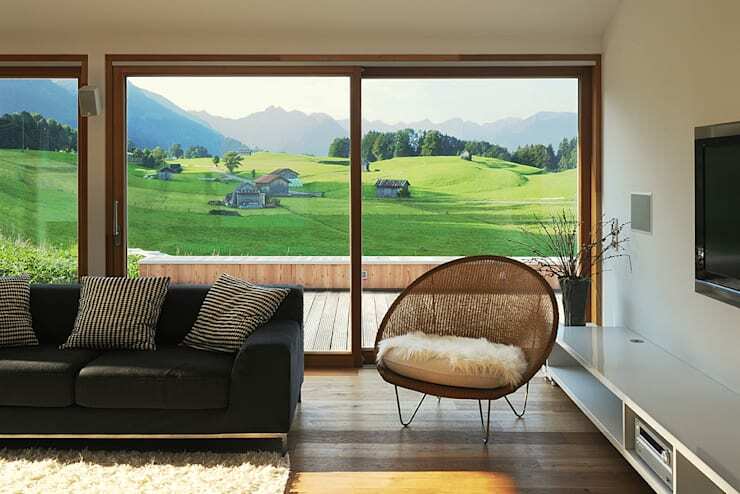 A fresh, Scandinavian wind blowing through the traditional Allgäu gives the house a dreamlike interior design. As is typical of the style, the gleaming white walls and light wood flooring add to the character, while the furniture chosen is in straight and in reserved tones with a few accessories completing the design. There are more ideas for a living room where this came from, simply have a look at the inspirational designs on homify! The minimalist interior design style, looks not only classy, but can also be admired for the fabulous views that come into play. Through the large picture windows you can enjoy them from almost any position in the house. And from this perspective, the surrounding nature looks almost like a painting. The effect is underlined by the window frame. As seen on beautiful works of art, the stretching green meadows in the horizon and the imposing mountain range are just gorgeous. The interior impresses with it’s an open-plan design and seamless transition from living, dining and kitchen area. The heart of the space is definitely the modern fireplace. The interplay of white, glass and silver that have been incorporated in it harmoniously add to the overall concept. Due to its central position, all living areas benefit from its soothing warmth and are visually separated from each other in a subtle manner. 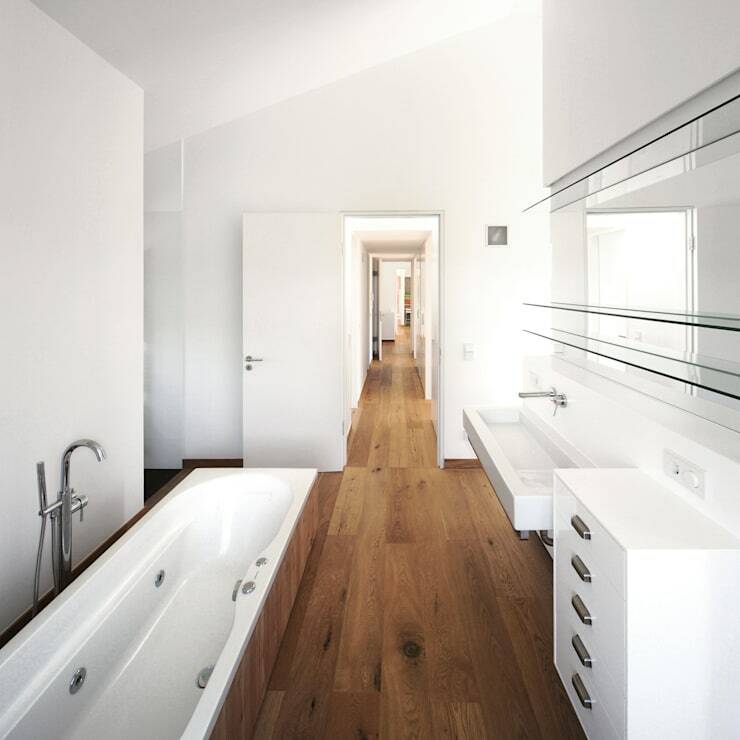 Instead of tiles in the bathroom have a look at this timeless idea, incorporating a wooden floor? It creates an extremely elegant touch in the area, which receives support from the simple and beautiful sanitary ware, a spacious bathtub has been included too! Thanks to the type of drain a plug is not necessary here—a clear plus in terms of comfort. The long vanity and large mirror counteract a stressful morning situation by offering enough space for several people to make use of the mirror. 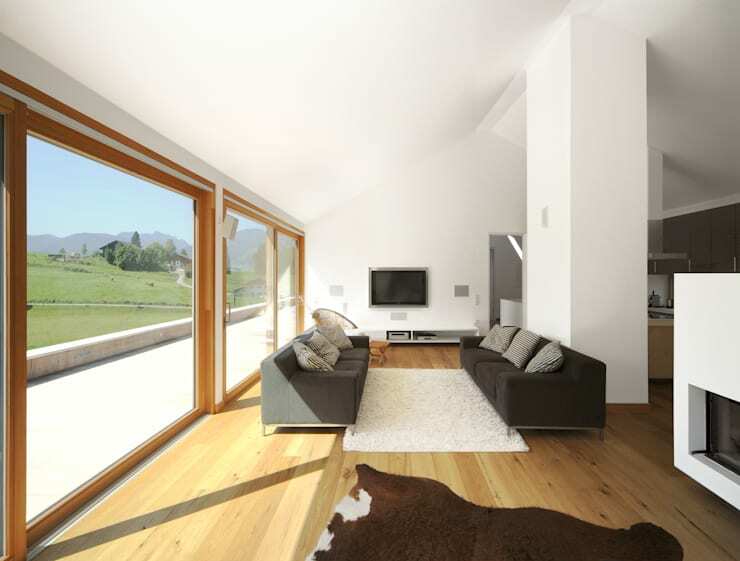 If you liked the design and location of this home, then don't miss: The Sound of Music House. Would you love to live in the mountains? Or perhaps you prefer the city? What's your ideal location to live?